There have been a couple of slalom hairy moments over the last few days. Reenie’s not really cut out for water flowing faster than – well, flowing at all, really. Having had about three days of tropical-except-without-the-warmth rain, yesterday we had a day of what turned out to be national news-level high winds. So navigating the last stretch of the Kennet bit of the Kennet & Avon turned out to be quite alarming: it’s a proper meandering river, with all the S-bends that implies. It seemed as though a lot of other boaters – although ones heading up stream, rather than down, as we were – found it all quite a fun little frollick. It’s probably something to do with this being both our home and containing pretty much everything we now own – which adds quite a large level of onerousness to navigating swollen rivers with strong currents, in high winds. And whoever designed in the slalom at Reading – through some new development of chain restaurants and nation-sized multiplexes – including a low arc bridge directly after a 90-degree turn: thanks so much. I won’t be coming back to Reading in a hurry (in a boat, or otherwise). We had a couple of locks where the wind caught the side of the boat and we got sort of…wedged, against the lock gate. It took all the might of whichever of us was pulling the centre line and poor Reenie’s engine (she’s doing very well, bless her) to get into a position to enter the lock. So jangled was I by the boat assault course, I was forced into becoming a Salty Sea Dog Lush by lunchtime yesterday and found myself an ale. Then a gin. Finally, we got through the slaloms, white-water rapids and so forth – no giant rolling boulders, Indiana Jones-style, though – and made it on to the Thames. (This was, after all supposed to be an Adventure.) We’d done the whole Kennet and Avon and the 104 locks therein, from Hanham lock in Bristol, to the very last K&A lock before the big River T. The locks along the illustrious river are all manned, which feels a bit of a luxury – and is also why you have to pay about £30 a day to be on here. Well, the Queen has to keep the swans in caviar and her own new barge spick and span somehow, eh? We shared a couple of locks with a nice couple in a very smart (retiree) boat yesterday. The lady (Gill/Jill, I believe) and I confided that we’d found the Thames a little like being on the high seas in the winds, even though – rationally speaking – the wind would have to be quite something to blow over a boat with a base plate of steel weighing several tonnes. Nonetheless, logic isn’t always at its fullest after a very long day cruising. We moored alongside Jill and Peter at Pangbourne, as there was no space – their very-smart boat is about the same length as Reenie. It’s funny being bunked up right next to another narrow, but at least our windows weren’t exactly aligned – it might have been too tempting to peek across, in the absence of television. I’m writing this as I flit back and forth from the twin-tub and its 9-minute energy-saving cycle (old school technology for the 21st century), as we really needed to do at least some washing. (While some might cringe at the funny colour the water goes, it’s pretty darn efficient). There’s still quite a curious disconnect between the outside space, which – as with yesterday – can be quite wild and fast-flowing, with strong currents and high winds; then there’s the inside space, which is cosy and domestic (and rather nice after we’ve home-ified it, if I may say so myself). Thankfully, outside is a little less rugged today – although the Thames is a little wider then Reenie’s really comfortable with (read: that we’re comfortable with). So I’m looking forward to getting on to the Oxford Canal tomorrow, which is meant to be very scenic. And suitable narrow, for a narrowboat. Today, we went through lock number 100 – and we started, when we left Bristol, through Hanham Lock, No. 1. So that’s a lorra lorra locks (as Cilla would say – well, she probably wouldn’t, but if she did, she might say it like that. And speaking of Cilla, I like to imagine that – when going through a lock – when it warns you of the Cill, that you could just add an ‘A’ to the end of it. The image of her emerging from the lock and saying ‘Surprise, Surprise, Chuck!’ amuses me greatly). Anyway, as the man said (Forrest Gump, I believe): “Life is like a box of chocolates – you never know what you’re gonna get”. Indeed, so are the locks – although unfortunately for us, we’ve been all too lacking in folks to share our locks with. It’s quite a sociable experience being on the canals and part of that is the necessity of moving tonnes of water around every now and then. We’ve been through lock flights with assorted retiree couples – who tend to have much smarter boats than liveaboards – and encountered various nationalities in passing at locks. Although it seems like canal holidays are particularly appealing to antipodeans and Nordic folks – particularly the Danes. But that’s just from our encounters thus far, it’s probably not very representative. A couple of days ago, we ended up sharing a flight of locks with a group of Yorkshire Boors, as I initially dubbed them. When I offered to pull their boat in from the centre line, his opening gambit was: ‘USE THE POWER, LAD: USE THE F***ING POWER!’ He then kicked the accelerator with his left foot, so as not to let go of his butterfly umbrella (his granddaughter’s, apparently). I’m pretty sure the way you treat a hire-boat is NOT how you treat a liveaboard. We’re pushing on towards Oxford and hoping to be able to moor there for a day or two and go into town to the Ashmolean Museum and the Pitt-Rivers Museum – both anthropological and arts, I think – and hopefully meet with friends and family there. Well, we’ve got to amuse ourselves somehow. See also: the various pictures of our posing with the tiller in ridiculous manners (Flickr feed to right). Having returned somewhat fuzzily from a wedding do on Saturday night (in Bristol), we made a little bit of progress – both along the canals and through our hangovers – on Sunday, ending up at Pewsey. Today, we pootled along to Bedwyn – and had to go down a flight of 11 or so locks. Having spent Friday going up Caen Hill and therefore up a pretty big hill, it feels almost like being cheated out of your altitude, having to come down all these locks again. Fortunately, we shared the lock-load with a nice couple on their holiday-home-boat – they’re a lot easier with two pairs of arms to wield the windlasses and push the gates. I don’t know if you’ve noticed, but there’s a bit of an infestation of bunting at the moment – Union Jack bunting, to be precise. It’s even made it across the canals and on to boats, like some invasive plant species they warn you about on the news. Although I’ll lay a penny to a pound that retiree and holiday boats are more susceptible to the epidemic than most liveaboards. Suffice to say we shall not be joining in the bunting infestation, or the Union Jack waving, or – worse still – the printed-out pictures of Her or any Royals in Reenie’s windows. Weird. The only quite amusing instance of flaggery was a washing line with assorted undergarments with the Union Jack upon them – including some large bloomers. Perhaps it sums up how I feel about the whole thing a little more. We went for a walk to get a quiet pint earlier, but the one of two pubs in Bedwyn that was open was already in full Royalist party swing. It seems they’re a big fan of HRH in Wiltshire. There was a covers band banging out soft rock numbers, while very many flush-faced middle aged people rocked back and forth, with that giddy smile of those who don’t get out very much. 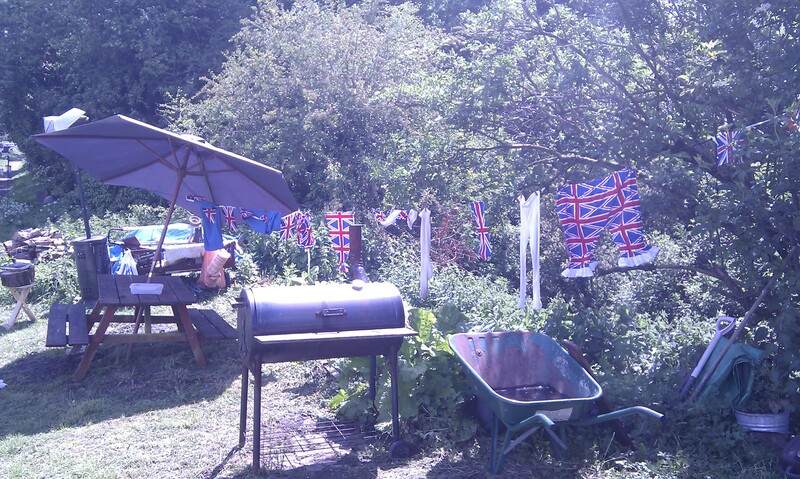 Not really something you can join in with later on, or if you really really hate all this Jubilee nonsense. We took on and won Caen Hill Locks yesterday – which was a marathon 35 in total. Once we got a system going though, draining the next one while the current lock lifted up 15 tonnes of boat, then we were quite quick at it. Paul and I did the initial six, then stopped to refuel ourselves with pasta – carbs are key for days like this – and then got through the first ten before our friend came to ably assist the rest…So that’s about 10% of the total locks to get to Leeds! There is the curious sense of being on display as various strolling OAP tourists observe your lock operation. At one point, I had to ask a staring old lady several times if she could move from leaning on the gate I was opening, so she wouldn’t end up at the bottom of the lock. It’s funny how you feel a little like a museum exhibit. But I also think it’s a grand thing for us to be so engaged with a bit of our industrial and engineering history, in such a real day-to-day way. OAP chat is also usually combined with plenty of chat about brands of canine. I particularly enjoyed a lady with a Newfoundland puppy-giant, who was having a chat with an over-confident Shitzu (how do you spell that? I’ll go phonetic, it’s funnier), slipping on his muzzle quietly: "He’s only a baby…" And the little dog would only have been a mouthful. We did some more cruising at the top, mooring just along from a pub where we had well-earned vittals. A nice lady from a boat along the path came to talk to us about the proposed changes to British Waterways becoming a charity etc, which would mean alarming powers for them such as compulsory land orders, and eviction of liveaboards. I dearly hope the boater community can get together and make sure we’re not marginalised in the Coalition’s/Tories plans to squeeze money for the few from everything they possibly can – including the canals. They’re already here for people to enjoy, so why – as Joni put it – take paradise and put up a parking lot? I’ll be blogging under the tag ‘Reenie’s Progress’ for our imminent journey to The North – Leeds, to be precise. It’s going to be a slow adventure: you can get there in about three-and-a-half hours by train, but it’s going to take us around six weeks. That’s how defunct we consider the rail network. Better late than never. On our way, I’ll be writing daily about our Inland Odyssey – as I’ve dubbed it – and the trials therein. It’s not going to take as long as Odysseus’ journey and I anticipate the Sirens to be in the form of appealing canal-side ales (luring us with their hoppy, boozey voices) and any whirlpools will be replaced by slightly-dodgy Industrial Revolution locks. While I’m no Royalist, apparently British Waterways (the not-so-shadowy entity which presides over our nation’s many miles of canal, etc) have had to step up their repairs in time for the Jubilee this weekend. At this moment, men in high-vis vests travail alongside various diggers, cranes and construction paraphernalia, watched over by HRH’s hench-birds – the swans – to ensure they get the work done in time for her big do. So thanks for the culvert, Ma’am – although the prospect of flotillas of inebriated weekend boaters in full Union Jack regalia doesn’t fill me with glee. Ah well – we’ll actually be able to get going, which is the main thing. I’ve been meaning to do some exposition for our current boating situation – the acquisition of Reenie and our move on to the canals – so I’ll post this and then get going on the Story So Far. Rest assured, there is Mild Peril (like on the film posters), Strong Language, and Scences of Violence (not to people, though – don’t worry). I’ll try to recount it accurately and with all the drama we’ve experienced becoming boaters.